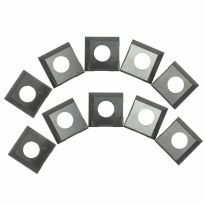 Helical-style head has double-sided insert cutters that can be rotated for a fresh edge and replaced when needed. The Rikon #20-600H 6'' Benchtop Jointer features a helical head with six rows of HSS insert cutters. 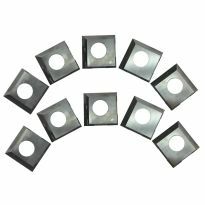 Each insert cutter has two pre-sharpened edges for for an exceptionally smooth, flat jointed surface. 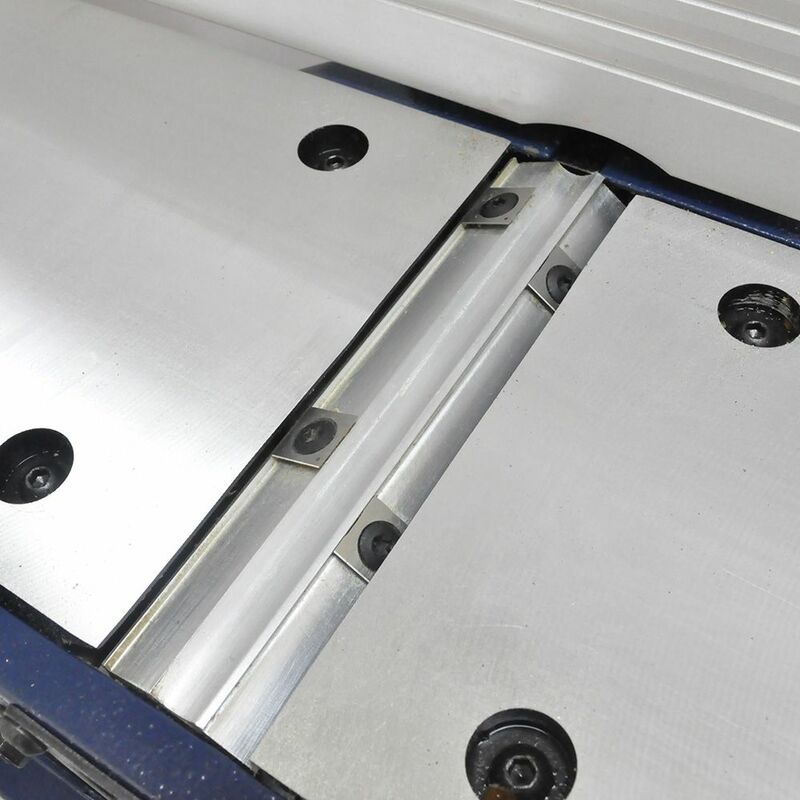 The cutters can be rotated to expose a fresh edge, and when it comes time to replace them, there is no need to level the knives as with a traditional jointer. 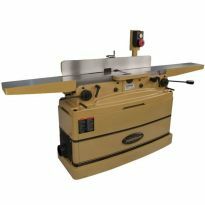 The jointer itself features rigid, all-metal construction, machined aluminum tables, a quick depth setting mechanism with scale, and an adjustable fence that tilts from 90° to 45°. It also comes with a spring-loaded safety guard, 2-1/2'' dust port, an easily accessible front-mounted on/off switch and two push blocks. It was easy to setup and worked great very satisfied with the results. This jointer has completely changed my woodworking. Everything is much more square and all my glue ups are going together a lot better. Sturdy, compact and affordable. Everything I need. Works better than I hoped. I'm super happy with the jointer. You need to move the wood through a little slower than expected, at least compared to the jointers I've used in the past. Makes sense since the square cutters are far less frequent then the expensive models. Thus, the "Helical-Style Head" vs true helical. Used it once to test it out. Awesome jointer. Then my garage caught fire and it burned up in the garage. Plan on getting a new one as soon as we can move back in. 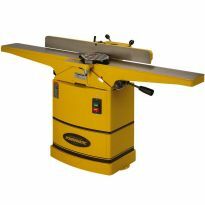 This jointer is perfect for working out of a garage or if space is limited. It does a great job at straightening boards. I am happy with my purchase. Very happy with this Rikon jointer. My first jointer and it works better than anticipated. This is my first experience with a Jointer. First of all it was very easy to set up. Final assembly was clear and easy. 90 degree angle achieved with no adjustment. Dust collection port also easy to install and use. I mounted it to a 2x10 about 2' long because I didn't order a table. Makes it heavy enough it doesn't offer to move. I'm very favorably impressed. I "jointed" two pieces of pine 1x4 and with stain it's almost impossible to see the seam. Think I'm gonna like this addition to my shop. Great tool, I would highly recommend it. Prefect right out of the box! Could not be happier. This piece of equipment is just what we needed. It planes so smoothly and for me, that is a big plus. Thank you. Works well right out of the box beautifully! This is my new favorite piece of equipment It's compact AND it works flawlessly. A really good price too. 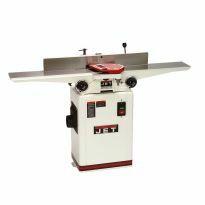 I recently purchased this jointer while it was on sale as part of the black Friday/Holiday specials. It was backordered, so I bought it online and had it shipped to my house. Rockler's shipping timeline was accurate and the jointer was delivered in a timely manner. The jointer was packaged well, but still easy to remove from the box. All the part were in perfect condition and the jointer was easy to assemble. The manual is easy to follow and accurate. I found the jointer easy to configure and it seems to hold alignment very well. After minimal use, I am very happy with my purchase. I am a middle school shop teacher and our old 8" Delta jointer finally became too difficult to maintain (Probably original with the school so 40 years old!). Anyway I purchased this Rikon model as a replacement with some PTA funds. We really don't do much work that would require a wider model so this seemed like a logical choice. The helical head cuts smoothly and the depth adjusts easily. Very pleased with the performance for the price. 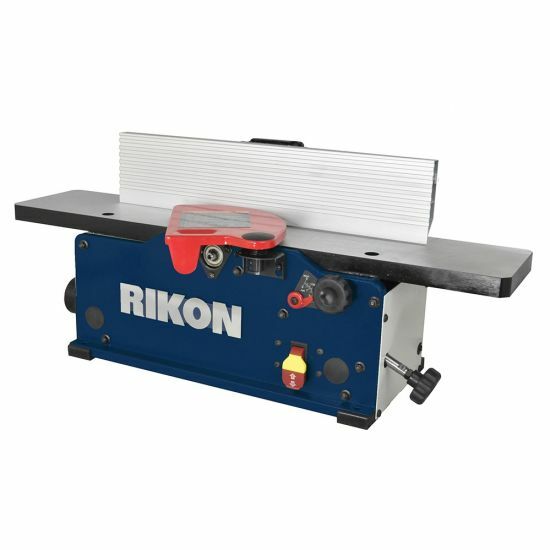 I have purchased 4 Rikon tools for the schools I have taught at: 2 sander combos, a small band saw and now this jointer. I thought all are of good quality, but the sanders and band saw were slightly underpowered. These were complements to existing stations, so they fit the bill for a school shop. Came out of the box ready to use. Cleaned and waxed the top. Checked factory set ups and they were spot on. Turned on and couldn’t believe how quiet it runs. Ran a couple on boards thru it and it did an excellent job. Hooked right up to my dust collector . So far working great. This benchtop jointer is awesome! Straight out of the box the infeed/outfeed tables were very flat and true, the fence was super easy to install and has set screws to keep it at 90 degrees when adjusting the fence, and cuts boards like a dream. The only negatives I have for it are that it is a little small so larger/longer pieces will be tough, and without dust collection on the chips clog up the dust port very quickly! Both negatives I can live with because of how much better the positives are on this unit. I would highly recommend this! My first jointer. It was easy to setup and adjust the fence. Used this for a couple of cutting boards and does a good job. I chose this one for 2 reasons, size and price. My workshopn is my garage so space is a major concern. It was better than I expected. To be fair, I have not used it extensively yet. Set up was simple, only took 10 minutes. The fence is a little finicky when adjusting (expected this at this size and price). Be sure to double check angles before running, I always do anyway. I don't rely on adjustable stops. I will update after more extensive use. I never owned a jointer/planer before I always hand worked what I needed. The assembly is straight forward (referred to instructions after I was done) took about 15 minutes over all. Worked great the first time. the dust collector port is an odd ID and would not fit my vacuum hose. Cut a slot with a hacksaw blade. my hose fits good and is not over tight. The first thing I ran though it was a old piece of rough 2x4. To be honest I thought it was out of adjustment the machine ran so quite. Thought I was not cutting anything, until I turned the 2x4 over and could see what a nice smooth finish I had. Then I ran a 6ft. cherry board I had though it. Did a great job, and you know that cherry is a hard wood to cut. Love the machine. First piece of Rikon machinery for me, and am impressed. Only had time to assemble at this time. Easy to do. Ran one board for a test. Should have bought this sooner. Will be using it at the beginning of the new year. Yes I would recommend it. Great machine, definitely use the dust port, or else it will clog easily and throw off your cuts. It’s a little small indeed and outfeed wise, so boards over 24” are a little dicey, but these are the limitations. The spiral style head cuts figure smooth as butter. My only qualm is that setting the fence square can be difficult, as when the fence tightener is turned tight, it kicks out the bottom of the fence. Maybe I’m over tightening, but a great machine otherwise. 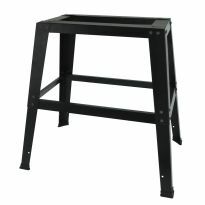 The stand that is recommended is not a direct fit, you will need a piece of ply cut to mount the jointer to the stand. My first jointer. Only a novice wood worker. Easy to assemble and easy to move. Seems to work very well. I use it to square up rough wood stock after planing to make toys. I just brought this jointer home today, setup took 30 minutes and I was off to flatting a bunch of hard maple for a butcher block island top. Very please with the square cutting blades a definite improvement over long single blades and they can be turned if dulled. All in all, for the price and for what I need, this jointer is terrific. I have used my jointer for a year. When the in-feed and out-feed plates are perfectly aligned, the unit is fine. Aligning them is a bit of a challenge. My second criticism regards the exhaust port. 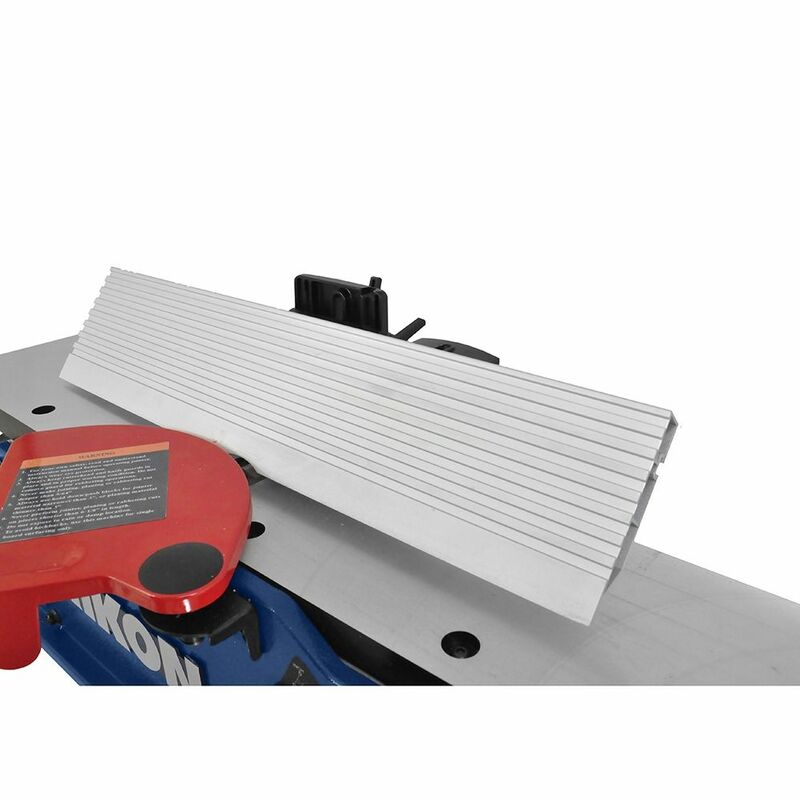 At 2 1/2", it is under-sized for a unit that is going to produce a lot of wood shavings. Even with a 6.0 hp shop vac, the jointer clogs up quickly. The port should be 4". I like the jointer overall. 2 sizeable oversights on the part of the product team, 1. The dust port on mine did not conform to the standard 2.5 inch hose and also requires two different screwdrivers to mount/remove and 2. When you buy replacement blades they sell you a 10 pack when there are 12 blades on the machine. Seemed to have the best reviews and a reasonable price. On sale and god reviews. Price and ease to setup. Positive reviews, small garage shop, on sale and Helical heads. My husband had it on his wish list. Portable and has very good reviews and a reliable company. Rikon manufacturers a quality product and the sale by Rockler was equally great! I purchased this because the reviews were good and name recognition. I like the Helical-style head and the fact that it is light enough to put our of the way in my small shop. I choose this because of brand recognition, but mostly because of the Helical-style head design. Also the many positive posts of reviews from customers that have purchased and used this unit. I also like the features described and look forward to seeing and using it for myself. I just hopeful that it meets all of my expectations. Extensive research and wanting to start with something small and mobile. Great price with free shipping..
What a great deal! Great price, free shipping, helical-style heads, Rikon quality... just hope it isn't delayed TOO long because of the huge reception this offer is getting! Because of the Helical-style head. I am making a workbench. 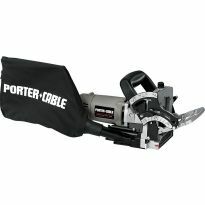 I have been thinking of purchasing this joiner for several months and had to take advantage of this great price. Since selling my big stationary joiner I have found a need for a bench top joiner for some new projects. My husband has other Rockler tools so I went to your web site to order his Christmas gift. Recommended by Rockler staff in store, great Black Friday deal. Excellent review in a woodworker forum. Highly rated and on sale. What's the difference between a 'helical style' cutter head and a helical cutter head? Can this jointer not be mounted on a solid bench? I mounted mine and only run it with the dust collector connected and running. There is a huge amount of chips accumulating in the motor compartment. Is this normal? What’s the difference between helical-style head and traditional helical head? BEST ANSWER: The number of inserts, the number of usable edges, the type of insert material (i.e. HSS vs CARBIDE) and the spacing configuration vary in each machine. A "traditional" spiral head has the inserts arranged along a spiral curve on the head while the helical "style" has the inserts attached to the head straight across but spaced in a staggered configuration. This results are less inserts used. These light duty bench top units would require less material taken off per pass and harder woods should take longer to process but small pieces shouldn't be impossible. Small scale milling work is feasible but don't expect commercial level work. Just noticed that the RIKON Design allows for the two (2) edge sharp carbide and not the four (4) edge sharp. They use the two (2) square edges as index. Does the rikon 20-600 come with a set of inserts or do you have to purchase a set from the beginning? BEST ANSWER: The RIKON that I purchased from Rockler is ready to use right out of the box. The Helical-style cutter head has carbide inserts installed. Each insert has four sharp edges. Actually it has two flat edges and two sharp edges on each insert. It comes with a set of inserts. Are you referring to the knives? If so, yes, it comes factory installed with a set. Replacements are also available.